If the ship is going down, Judith Haase is the kind of person you want in your lifeboat: not only is she a great swimmer and a retired nurse with decades of experience (including stints in the Peace Corps and CARE), but she also has the indomitable spirit that would get you through a crisis. She survived her own health crisis of a stage III breast cancer diagnosis in 2013 and oh, yes, she's also a Katrina survivor. "Sometimes you’ve just got to push through," says Haase. "You don’t want to, but you do it." Haase says she struggled with both the physical and mental aftermath of cancer diagnosis and treatment. 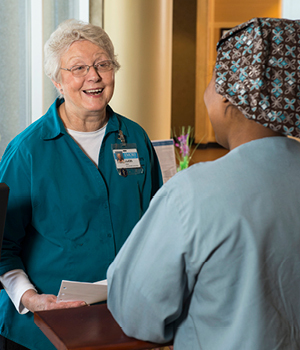 Enrolling in the Winship at the Y program helped get her back in the exercise groove and talking with Winship psychiatric oncologist Wendy Baer "saved my life." She kept swimming throughout treatment. She says it helped alleviate side effects like lymphedema and continues to induce a meditative state that acts as a mental salve. 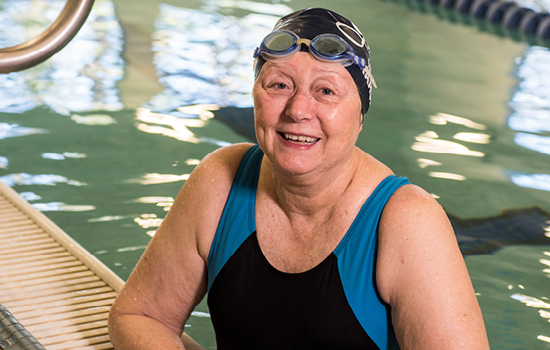 Now 75, Haase volunteers two days a week at Emory Saint Joseph's Hospital, which is where she got her chemo and radiation treatments, and she swims three days a week. Ten years ago, she was recruited to swim in U.S. Masters competitions both as an individual and as a member of Killer Whales, a Georgia team whose motto is "The older we get, the faster we were." She's determined to qualify for the Senior Games in 2017 to be held in Birmingham, Alabama.